Not all ducks are created equal. 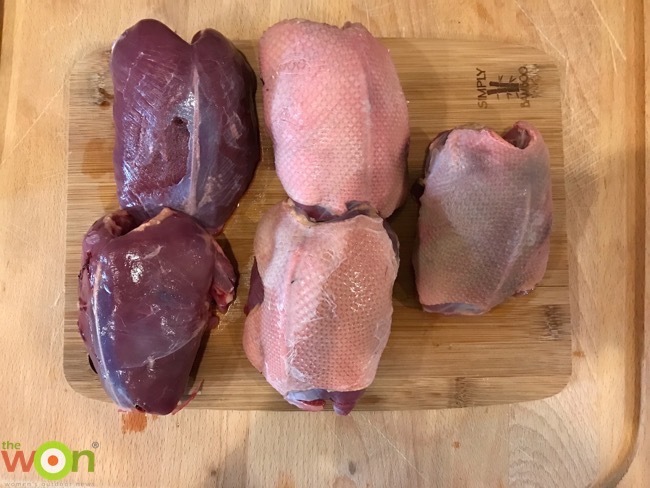 If someone offered to cook you a mallard or a bluebill, you’d choose the mallard, right? Swap out the bluebill for a blue-winged teal, and I’ll pick the teal every time. There is quite a variation in taste across the different species—big or small, puddle ducks or divers. It’s the truth, and one that we as hunters must find ways to work around when we get back to the kitchen. 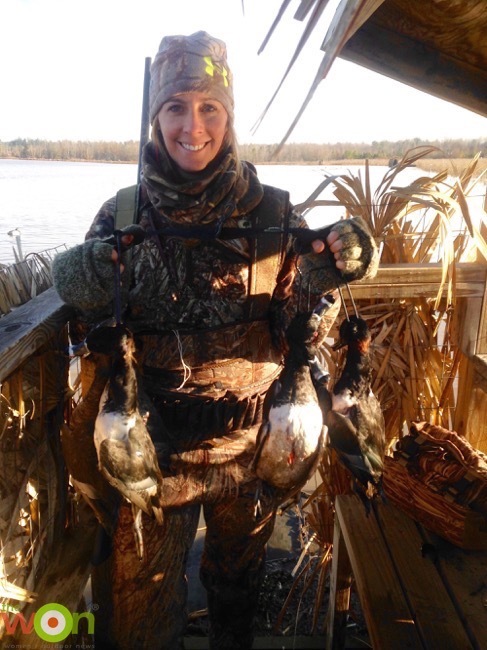 After all, it’s not often that you can pick and choose the specific ducks that make up your limit, especially here on the East Coast. We eat what we are fortunate enough to shoot, and duck can make one killer meal if cooked properly. All you need is a big Dutch oven, a little bit of time, and a great, foolproof recipe like this. A few weeks ago, I limited out on ringnecks alone. I’ll take it! The ducks don’t need to look perfect when they’re prepped. They’ll look delicious in no time. In a large, oven-safe pot or Dutch oven, heat olive oil over medium heat. Place the ducks skin side down and sear until the surface is golden brown, about 2 minutes. Remove from the pot and set aside, turning off the heat as well. 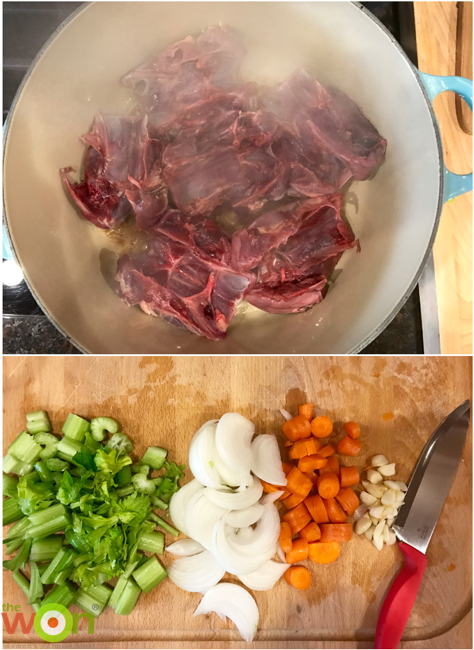 While the ducks are resting from the sear, chop the onion, carrots, celery and garlic into bite-size pieces. Next, it’s time for everyone to get back in the pool. Use the vegetables to create a layer at the bottom of the pot, and place the ducks on top, skin side up. Place the cubed butter around the ducks, leaving a piece atop each one (if you can make it stay). Sprinkle with salt, pepper and Italian seasoning, and pour in the stock. *I noted above that the recipe takes 4–5 cups of stock. This will vary depending on the size of the pot you are using. You want the liquid to cover about ¾ of the ducks, without submerging them completely. No stock on hand? Just use water—there’s plenty of flavor already. With the lid on, place the pot in a 350° preheated oven and cook for 2.5 to 3 hours. You don’t even need to set a timer. Let the ducks do their thing—no peeking!—and they will be fall-off-the-bone tender when you take them out of the oven. Remove the pot from the oven, and it’s time to eat. I usually serve this by spooning some of the vegetables and liquid over a bed of rice before adding the duck on top. Serve hot, and expect satisfied bellies all around. See what I mean? Falling off the bone with only the slightest graze of the fork. 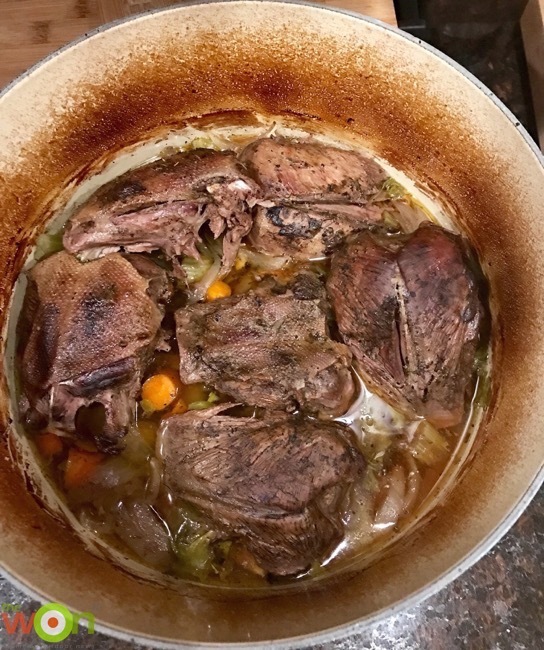 A big thank-you to my father-in-law, Parker, who first showed me this dutch oven recipe. It is quite a hit, and has a permanent spot on my list of go-to duck dishes.